(Bloomberg) -- Ford Motor Co. descended into the red in the final three months of 2018, dragged down by deeper deficits overseas and a loss on its pension fund. Chief Executive Officer Jim Hackett has been trying to overhaul the automaker by killing off slow-selling sedans, boosting spending on sport utility vehicles and trucks, and making salaried staff cuts worldwide. Last week, he announced an alliance with Volkswagen AG to jointly develop commercial vans and trucks and said the two companies will explore working together on electric and self-driving cars. But analysts have criticized the company for not providing more details on its turnaround plans and failing to give guidance on its 2019 outlook, other than saying it has the potential to be better than last year. Ford shares swung between gains and losses in late trading. The shares have rebounded somewhat this year after plunging 39 percent in 2018. The CFO reiterated that the U.K.’s efforts to leave the European Union have major implications for the company, whose namesake brand is the top-seller in Britain. 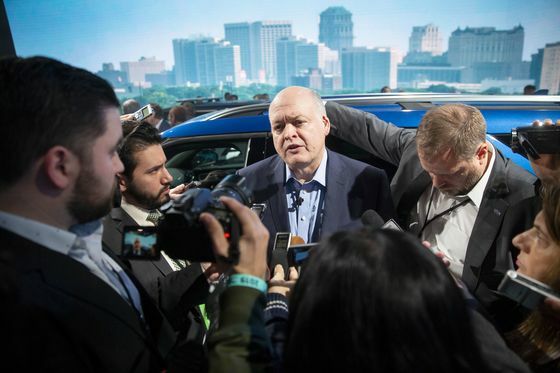 If the country ends up making a so-called hard exit from the trade bloc in March, there will be a “material impact” on Ford, Shanks told reporters. Ford reported an $877 million loss on its pension and retirement-benefit plans for the quarter. Excluding that and other items, the company posted an adjusted profit of 30 cents a share, in line with analysts’ estimates and preliminary results released last week. That’s down from 39 cents a share a year earlier. 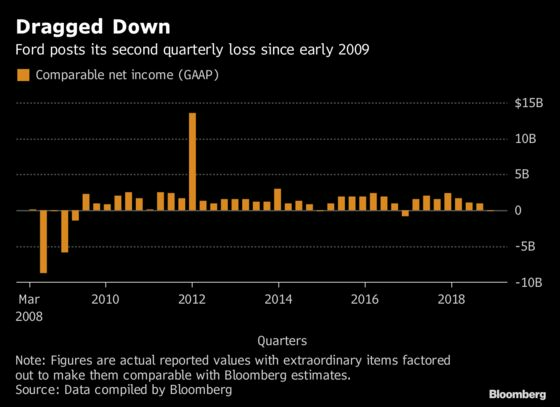 While fourth-quarter earnings before interest and taxes were higher in North America, as Ford sold a richer mix of higher-priced trucks and SUVs, the company posted bigger losses than a year ago in Asia, Europe and South America.